Each NHL season, every player has the goal to better themselves for the next 82-game slate. Whether the player is already in the NHL or not, they’re preparing themselves in the offseason to find a spot on the roster. There are plenty of players in the league today that don’t have much more to prove (i.e. Sidney Crosby, Patrick Kane, Patrice Bergeron). Each of those three players has an extraordinarily large trophy room. Their careers could end today and they would all be viewed as iconic hockey players forever. On the other hand, there are many players who don’t have the bulky resume. Some are looking to improve to the point where they overcome a rough patch in their careers. Or maybe they’re attempting to prove they belong in a certain spot in the lineup. With less than a month before training camp opens, here’s a trio of Blue Jackets players who have the most to prove this coming season. The entire season is important to every player, of course, but I feel there are three specifically that must demonstrate their worth and erase any doubts attached to them. The NHL preseason is a great timeframe for players to make a statement. Those couple weeks before opening night can be pivotal for a young player’s career. 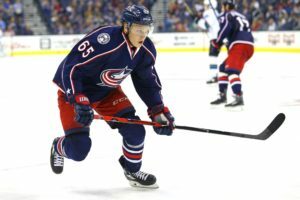 Take a look at Blue Jackets’ defenseman Markus Nutivaara for example. Last September, nobody knew who the kid was. As a seventh-round draft pick in 2015, his chances to make it to the NHL and succeed were extremely slim. But there he was playing game after game in the preseason a year ago because his performances were striking enough to draw attention. Nutivaara started opening night and served as a reliable member on the back end for the Jackets all year. Pierre-Luc Dubois is in a somewhat similar position. He has a chance to impress during training camp and through the preseason. The difference between him and Nutivaara, though, is that everyone expects Dubois to make the roster. 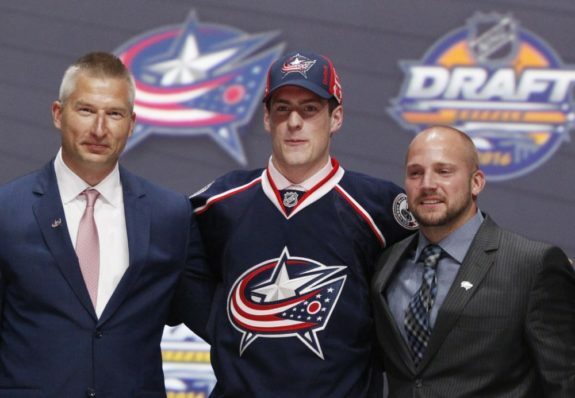 He technically shouldn’t count as a Blue Jackets player looking to prove himself because he’s not a current member of the roster, but he is the most highly touted prospect in their system. Dubois is coming off a year of regression in the QMJHL which has caused the Blue Jackets organization to question his development. He has a chance to silence the doubters over the next month and a half. The opportunity is right there in front of him to display that he can make the jump to the NHL this season. After William Karlsson’s departure to Vegas via the Expansion Draft, the Jackets currently have an opening in the middle on the third line that most expect Dubois to fill. If he can showcase that he’s NHL-ready, he’s likely to benefit from a lot of ice time amongst the big boys. If he isn’t ready, he’ll have to return to the QMJHL and work hard to prove he’s ready to take on a larger role next season with the Blue Jackets. It has mostly been an unfortunate career thus far for the 23-year-old defenseman. He’s been continually struck by injuries that has led people to doubt his durability. Furthermore, he hasn’t produced like a former second overall pick should. And on top of all that, the Jackets have constructed a sturdy top-four that Murray probably can’t crack. Because of this, Murray may appear to be expendable. He did play in all 82 games a couple years back after only 12 games the year before. However, he missed 22 last season and only produced 11 points. In his career, he has 60 points in 220 total games. Those kind of totals don’t exactly equate to a player that was drafted second overall five years ago. Here’s what I know – Murray is a reliable defenseman in his own end. He receives a lot of heat for not being noticeable most nights. The counter-argument to that is that sometimes it’s a good thing. In this day and age, I think everybody wants to focus on what a player does in the offensive zone whether it be a forward or a defenseman. I can tell you that if you watch the tape of Murray in the defensive zone, you’re going to like what you see the majority of the time. Sure, he’s likely not mentioned as part of the Jackets’ top two defensive pairings. But he’s a luxurious option to have as a team’s fifth defenseman. Right now, he might not be considered a part of the Jackets’ long-term plan, but he has this season to make them reconsider or at worst, showcase his abilities to other teams that may want to make him part of their own plan. This could very well be labeled a make-or-break year for Murray. Bobrovsky has proven to everybody that he’s a world-class goaltender after the second Vezina win of his career this past season. His work ethic and dedication is second to none. Like Murray, he has battled questions about injuries over his career. But last year, he started in a career-high 63 games without dealing with any big injuries. The Jackets would be thrilled to see Bob start 60+ games again next season without him ever hitting the IR. After winning his first Vezina, though, he followed it with three seasons in a row in which his save percentage dropped each year. It’s completely evident that Bobrovsky is the number one goalie for the Blue Jackets and perhaps the number one goalie in the league. But I think it’s important for him to back up last season with another stellar year. He’s due for a new contract after the 2018-19 season so he should give the Jackets no reason to believe he can’t be their guy anymore. 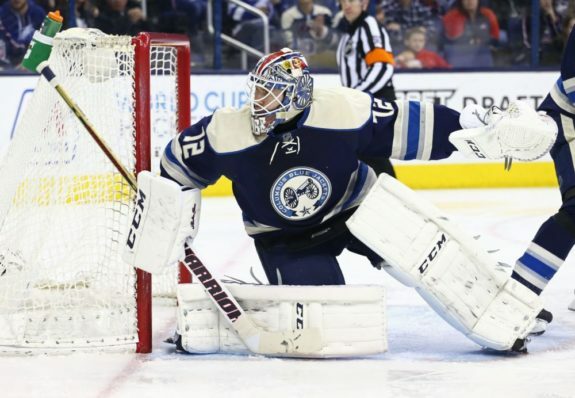 And with young star Joonas Korpisalo knocking at the door to take over his throne, Bobrovsky should have even more motivation to string together consecutive outstanding seasons. We’re all aware by now that Bobrovsky is an elite goaltender who can win a game by himself. We are also aware that he has struggled mightily in his playoff career. That is what Bobrovsky has to overcome more than anything. He owns a career 2.45 goals against average (GAA) and .920 save percentage (Sv%) in regular season games. His numbers in the playoffs, however, are a 3.63 GAA and .887 Sv%. That contrast is staggering. It’s hard to believe that it would be a mental thing because Bobrovsky is so focused all the time but he did say he would be willing to consult with a sport psychologist to cope with his playoff woes. The Jackets obviously have to make the playoffs in order for Bobrovsky to overcome his postseason struggles. If they do get back to the postseason this year, Bobrovsky will be under a microscope. The Jackets had a ton of success last year with Bobrovsky healthy and playing lights out. If they are still playing hockey past April 2018, it’s likely for the same reason.